This is a country that has a middle class larger than the entire population of the United States—and yet, despite ongoing controversy over India’s poverty numbers, at least 350 million Indians live on about 50 cents a day. Its population includes roughly 160 million Muslims—and yet, it is the world’s second largest importer of Israeli weapons. And while U.S. Secretary of State Hillary Clinton said last year that the relationship between the U.S. and India will shape the 21st Century—this “true friend” of the U.S. imports more oil from America’s sworn enemy, Iran, than any other nation. It is the issue of oil that has put India’s unique friendship with the U.S., Iran and Israel under an intense spotlight. Under a new U.S. law designed to use oil to pressure Iran into ending a nuclear program that Israel and the West believe is dangerous, countries that do not significantly reduce their imports of Iranian oil by June 28 can be denied access to the U.S. financial system. India, which imports roughly 10 percent of its oil from Iran, denounced the strong-armed tactics and announced that it would not abide by the sanctions. Since then, Delhi has devised creative new financing vehicles independent of Western banks to help Indian refineries continue to engage Tehran. No country in history has ever faced the epic human challenge of managing a country of 1.2 billion people, where at least one in three rural residents and one in five urban dwellers live in abject poverty. Supplying the energy needs of an economy expected to grow from $4.5 trillion in 2012 to $86 trillion in terms of purchasing power parity by 2050—at a time when half a billion Indians live without electricity, instead relying on petroleum-based kerosene for light, heat and cooking—is daunting itself. Complicating matters is that many of India’s refineries are designed only to process the type of light crude oil Iran sells, and retrofitting takes time and costs a fortune. India is new to these kinds of loyalty litmus tests. In the six decades since it gained its independence from Britain, New Delhi has famously pursued a policy of strategic neutrality. Jawaharlal Nehru, India’s first prime minister, even co-founded the Non-Aligned Movement during the Cold War, made up of states not formally aligned with any great power (even though, in practice, India leaned heavily toward the Soviet Union after the U.S. started to arm India’s enemy, Pakistan, in 1954 to contain communism). But for a country that aspires to great power status, which actively seeks a permanent seat on the United Nations Security Council, the Iranian oil crisis is India’s first great test of the 21st Century: can a true world leader be non-aligned in a globalized world? Is it really possible to be a “true friend” to two sworn enemies? 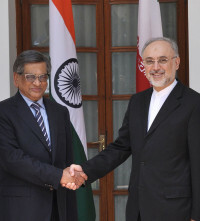 While India works with Iran, some say, partnership should not be confused with friendship. As the June 28th deadline quickly approaches, what should the U.S. do? First, the White House should publicly affirm its wider support and friendship with India. Second, it should recognize that India has already reduced its imports from Iran from 16.4 percent in 2008 to 10.3 percent today, and grant India a waiver—as it has to 10 other countries, including Japan—to give it more time to meet further reductions. Third, the U.S. should help India secure financing and expertise to retrofit its refineries to enable them to process more than just Iranian oil. In many ways, Iran is to India as Pakistan is to the United States: an uneasy marriage with an unstable partner that is borne of necessity more than affection, which New Delhi—like Washington—would give up in a heartbeat if there was any real alternative. Legend has it that Lord Shiva was never more powerful than when he was dancing. Time will tell if the same may be said of India. This entry was posted in Articles, India, Indonesia, Israel, Op-Eds, US and tagged China, H.E. Ranjan Mathai, Iran, Israel, Jawaharlal Nehru, Kanwal Sibal, Lalit Mansingh, New Helhi, Saudi Arabia, Subhash Agrawal by Stanley A. Weiss. Bookmark the permalink.